On the 100th anniversary of the Russian Revolution, artist Uldus Bakhtiozina offers a surrealistic rebuke of the consequences of revolution. This year marks the centenary of the 1917 Russian Revolution, a pivotal event that dismantled an empire, gave rise to the Soviet Union, impacted millions of lives and reshaped the world. 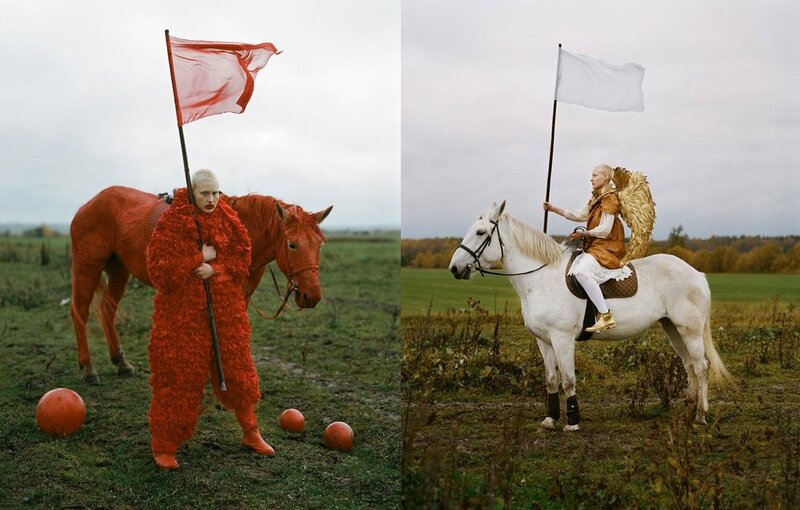 Russian artist and photographer Uldus Bakhtiozina is marking the occasion with characteristic beauty and irony with THE CIRCUS 17. This exhibition, up at Anna Nova Art Gallery in St Petersburg, offers a surreal, alternative take on what happened in the Russian Empire in 1917 during the February and the October Revolutions — as well as on the dynamics of politics in general. With video installations and photographic works that reimagine the major themes and players of the Bolshevik Revolution as early-20th century circus performers, Bakhtiozina alerts the audience to the possibility that revolution may be mere spectacle, a kind of power-play theatrics wired into human nature so that it comes around again automatically periodically in history, regardless of the ideology or cause underpinning it.